The Equinox offers you to easily control your vacuum level inside your plasma chamber. Switch on the pump and that’s it. No need of intervention after saving the set point pressure. The pressure will stabilize from the atmosphere to around 500 mTorr under 1 minute. The stability can be adjusted to the equipment and the pressure kept at +/- 50 mTorr. The Equinox can be used with several gas and directly with air, that enables to do efficient and fast PDMS plasma bonding. The Equinox offers you to easily control your vacuum level inside your plasma chamber. Indeed, contrary to a manual vacuum gauge where the laps time can be long as several minutes, the Equinox enables a stable and fast set to the right pressure. What’s more, for your routine process, set your pressure only once thanks to its internal memory the Equinox will remind two of your commun pressure sets. 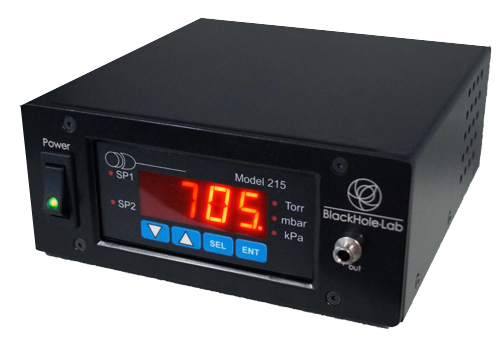 The equinox can be used with several gas and directly with air, that enables to do efficient and fast PDMS plasma bonding. A necessary 5µm filter is added when working with ambient air, to guarantee a clean air. The pressure is automatically set thanks to the electro valve and the gauge controller. The precision depends on the suction power of the pump and so depends on each installation but the Equinox can be adjusted to each situation during the installation to offer an accurate set more or less 50mTorr. The Equinox gathers really tough tools and almost none maintenance is required. The pressure control is guaranteed thanks to an electro valve that can handle 250 million of cycles and so promises a long life time. The only maintenance operation needed is to change periodically the air filter if you use ambiant air as gas. Ensures accurate and stable pressure set points. The resolution can be adapted and generally about more or less 50mTorr. The digital screen makes this too really easy to use. The Equinox is adapted to be used with air or with a specific gas. The PID regulation unit enables a fast and easy pressure decrease prevent you to usual long response time from manual system. Can be used with specific gas but also with air, enables to control your pressure for PDMS bonding. As all the facilities are different, (vacuum pump, plasma chamber size…) the Equinox can be adjustable to have the best resolution anytime. Thanks to the internal memory, set you parameters only once. Easy to use and set vacuum point.